The type of Icon is the 'Mother of God with Three Hands' and it is a free copy of the original which was owned by St. John of Damascus. 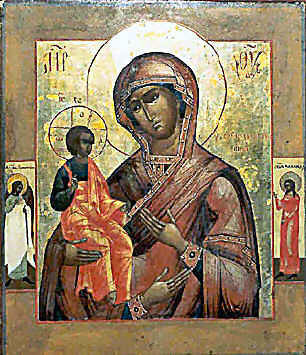 The Icon of the Mother of God which he had was a standard Icon with only two hands. He lived during the time of the Iconoclast heresy and was a Christian minister in the court of the Calif. He was therefore free from the persecution that the Orthodox Christians were suffering at the hands of the Iconoclast emperor. As a result he was able to write and to publish a number of works in defence of Icons and their use. The most well known of his books is “The Defence of the Divine Images” which has been translated into English. However, his arguments so infuriated the Iconoclasts that they got at him and cut off his right hand to prevent him from writing. The Saint prayed before the Icon of the Mother of God, asking her to heal him so that he might continue to write in defence of Orthodoxy. Then, pressing his right hand against the stump of his arm he discovered that the two were joined together again and that he was miraculously healed. As a thank offering for this wonder he had a metal hand made and attached it to the bottom of the Icon. This is still the common practice in the Orthodox Church, particularly in Mediterranean countries, and Icons festooned with little metal models of limbs or even whole bodies may be seen. This Icon type became very popular all over the Orthodox world, but Iconographers are not often metal workers as well and so the hand tended to be painted on. It would seem that these later painters misunderstood the significance of the added hand and made it a third hand of the Mother of God. The icon is on display in The Lady Chapel.